It began with an email from a “hippy-looking, long-skirted person” and it ended with the gifting of a prestigious award back to New Zealand Red Cross. In 1980, Janet Williams was posthumously awarded an Outstanding Service Award for Distinguished Service in Hastings. For more than 32 years, Janet gave consistent service to Red Cross at both the branch and service centre. She led by example, encouraging everyone she worked with and assuming many positions of responsibility. Miss Williams was an inspiration to many people and the H B Williams Family Trust generously donated a station wagon to transport disabled and elderly people to appointments. Sadly, in 1979, Janet and her sister-in-law died in the Erebus air accident. Tribute was paid to both for their unwavering support of New Zealand Red Cross, the Hastings branch and service centre. The newsletter from 1980 of Janet (front) in which Anna spotted herself. 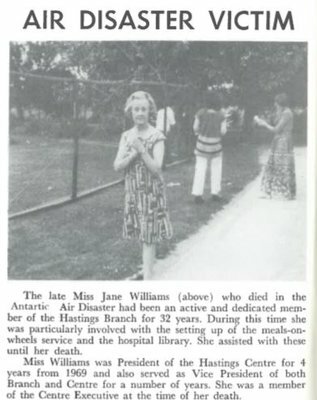 Recently Anna Williams, Janet’s niece, contacted New Zealand Red Cross to enquire about re-gifting her aunt’s award. While in correspondence, Anna received copies and photos of her aunt from the New Zealand Red Cross Annual Report and Red Cross Newsletter. The award is currently in New Zealand Red Cross archives. It is likely to be displayed at the Hastings Service Centre, at the heart of the community Janet loved.